In his previous visit to Tasmania Jason M did very poorly. 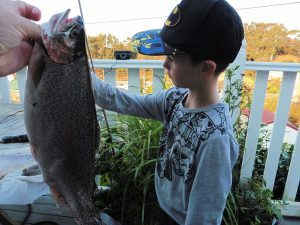 With his later family visit over Easter, he decided a different approach would be needed if his boys were to catch a Tasmanian trout. Three days and some nefarious methods eventually brought success. This entry was posted in Places on May 7, 2017 by bill.